On a Sunday afternoon in April 2003, Aron Ralston, a 27-year-old outdoorsman, set out for a hike in a remote area of the Utah Canyons. An experienced mountain climber, Ralston planned a trip that, for him, was so easy he didn't bother to tell anyone where he was going, let alone pack enough provisions that would last more than a day. After a routine move, a boulder dislodged and pinned his hand against the canyon wall. Little did he know that he in five days he would have to make the hardest decision of his life: to cut off his arm to free himself, or face certain death. 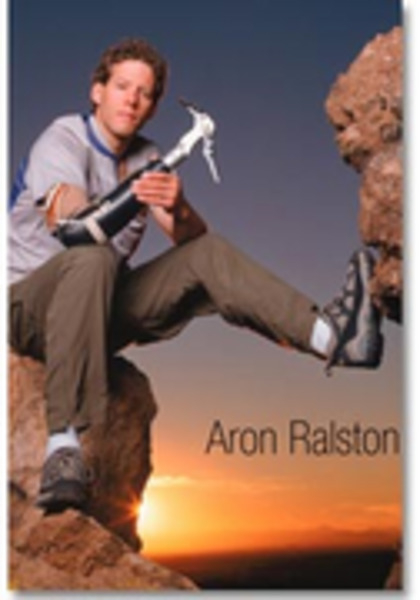 Aron Ralston freed himself from the boulder, applied a tourniquet to stop the bleeding, and administered first aid before rappelling to the bottom of the canyon and hiking out to meet rescuers. Aron had moved to Aspen, Colorado, in 2002, where he has been attempting to climb the fifty-nine Colorado peaks of more than 14,000 feet solo in winter. He is now more than three-quarters through his goal. His book, Between a Rock and a Hard Place, was published in 2004. Today, Ralston draws on the same determination that got him out from under the boulder, to continue climbing mountains and sharing his story of survival.